(MENAFN - Newswire.com LLC) BELLEVUE, Wash., April 9, 2019 (Newswire.com) - With unicorn theme parties going beyond magical, USA Toyz , one of the top toy and party supply sellers on Amazon, announced the launch of their new 163 piece Unicorn Party Pack. It's time to call the unicorn squad because this party pack has everything the birthday girl or boy needs to host ten of their besties. Everything from invitations to unicorn decorations to goodie bags and party favors comes in this complete party pack. 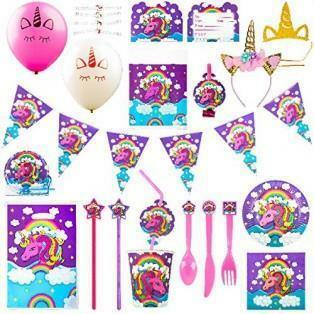 Unicorn party decorations are just the start; get unicorn cups, plates, utensils and napkins with your pack of unicorn party supplies. And don't forget the magic of dress up. Every unicorn party supplies kit includes a beautiful unicorn headband adorned with sparkly ears and flowers for the guest of honor, and 10 paper unicorn crowns for the party guests. Believe in the magic of unicorns and your ability to pull off an amazing unicorn party for kids or adults. Yes, the flexible unicorn horn headband fits adults, too. The bright pink and purple party supplies feature rainbows and clouds to pair perfectly with rainbow and unicorn-inspired food served at any unicorn-themed party. Need more unicorn party ideas? Use the included 10 unicorn balloons and triangle pennant banner to stage a unicorn backdrop for selfies. Set up a scavenger hunt to find the magic wands and unicorn bracelets found in the mega unicorn party pack. Let guests collect their findings in the matching unicorn party favor bags. Be sure no one leaves the unicorn party without one of the unicorn pocket pinball games and noisemakers. The 163pc Unicorn Party Pack is sold on Amazon and USA Toyz. Centuries ago, explorers would go out in search of the mythical unicorn. Today birthday girls and boys can celebrate the uniqueness of unicorns with endless unicorn inspiration found at USA Toyz. Want more sparkly unicorn headbands for your unicorn party? Pick up a 6 pack of unicorn headbands for friends, siblings and kids and parents to enjoy together. The shiny metallic gold unicorn horn, glitter ears and soft flowers make the perfect unicorn party hats and unicorn party favors. The 6pk of Unicorn Headbands is sold on Amazon and USA Toyz. Looking for a quiet space for girls and boys' playful imagination? The one-of-a-kind unicorn play tent from USA Toyz, with bonus unicorn headband, is a secret hideaway for kids to read, relax or play with friends. Vibrant colors and an exclusive design will sweep kids away to the realm of unicorns! Parents love the tent because it's easy to assemble, clean and store. Let this adorable tent be the focal point of a girl's enchanting bedroom decor – or a unicorn party! Here's a unicorn party tip – set up the unicorn play tent as a unicorn photo booth and use your unicorn headbands, wands and other unicorn party decorations as photo booth props. Your unicorn birthday party is sure to be a blast! The Unicorn Play Tent for kids is sold on Amazon and USA Toyz. USA Toyz is a brand owned by Kaliber Global, a top-tier Amazon seller and the fastest-growing retailer in Washington State (Inc. 500, 2017). They are a locally owned family business based in Bellevue, Washington that specializes in launching fun, innovative products on the Amazon Marketplace since 2012.